Delivered to your email twice monthly! When it comes to environmental compliance, the Advisor is your "peace of mind" guide to environmental protection agency (EPA) regulations at 40 CFR. This digital plain-English newsletter gives you practical compliance advice on every key environmental compliance topic and acronym from CERCLA ... RCRA ... NESHAPS… NPDES ... to SPCC. Subscribe now and join thousands of environmental professionals who have counted on the Environmental Manager's Compliance Advisor newsletter's practical advice and best practice case studies for over 30 years. 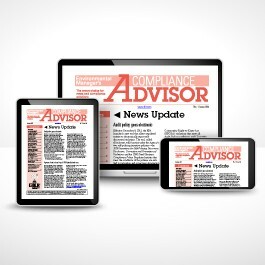 The practical features in this twice-monthly advisor eliminate the worry that you might miss, or misunderstand, an important new regulation. Saves time and worry with concise reports on what EPA, DOT, state regulators, and environmentalists are doing, planning, or promising to do and what that all means to you. In-depth analysis and answers to tough questions on new environmental regulations, enforcement, and industry trends. Plus best-practice advice on topics like MACTs, brownfields, clean water, emergency preparedness, oil spills and SPCC plans, NPDES, risk management, and much more. Just frequent enough to keep you informed without overwhelming you. Sent 2x a week — keeps you right on top of the latest news. You’ll enjoy and benefit from learning how to avoid slip-ups on the EPA regulations that give compliance managers the most trouble. "This newsletter is excellent and I really enjoy reading it!" Call 800-727-5257 to receive the Environmental Manager's Compliance Advisor via e-mail. GUARANTEE: Your 100% satisfaction is guaranteed. If for any reason you are not completely satisfied with Environmental Manager's Compliance Newsletter, simply let us know within 90 days, and we will issue you a complete refund.